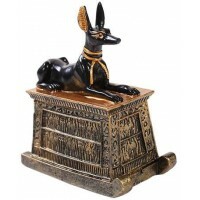 Gorgeous Egyptian Revival style square trinket box features a kneeling Priestess on the top. Bronze resin trinket box is 5 1/8 inches high with lift-off lid. Hand-painted color detail. Item Number: UI-WU76971A4 | Approximate Size (Inches): 3.50 wide x 3.50 deep x 5.10 high | Approximate Shipping Weight: 2.00 lbs.